Several times every year, I visit the Unity Archives and look for interesting material that feeds my personal study of Unity teachings. This post and the project I am recommending that we embark upon would give the same opportunity to you and to others who care deeply about the treasures kept and protected by Unity World Headquarters. I am a cherry picker. I rummage through the various collections in the Unity Archives like a prospector pans for gold. The dictionary definition of “rummage” is “to search unsystematically and untidily through a mass or receptacle.” I usually find plenty of gold. But to do this, I need to travel to Unity Village. It’s my pleasure to do so, but it’s not something everyone can do. In order for you to have the same access, two things need to happen: (1) The materials need to be scanned and made available online (2) the content of those materials needs to be compiled so that you can find what you’re looking for without searching for needles in haystacks. The project I am proposing is that I and others do the scanning and that you and others “do the compiling.” Here’s an important point: the reason this project may be successful now is that Google and other Internet search engines really do the compiling for us. Let me explain what I mean. Until now, the only way to compile information has been by assigning “key words” to content. Key words are categories, and categorizing information has been the basic method of organizing data for doing research. But Internet search engines are now smart enough to assign key words to content for us. Our job is no longer to categorize things, but rather to make sure the data is clean and readable enough so that the Internet search engines can do the categorizing for us. I cringe when I see highly trained professionals devote large amounts of time to tagging the data when they could be focusing on what they do best: interpreting the data. So here’s the project. There are 92 boxes of materials in the Charles S. Fillmore Collection of the Unity Archives. 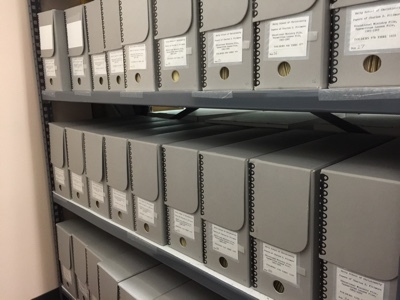 About one third of those boxes are handwritten manuscripts by Charles Fillmore, collectively known as the “Handwritten Lesson File”. They are in boxes 1 through 23. Another third of them are typed transcripts of Mr. Fillmore’s talks and lessons, collectively known as the “Typewritten Lesson File”. They are in boxes 24 through 51. The final third of the boxes are an assortment of other materials, such as book manuscripts, lecture notes and Bible references. They are in boxes 52 to 92. Earlier this month I scanned all the content of Box 24. Box 24 has 45 folders. 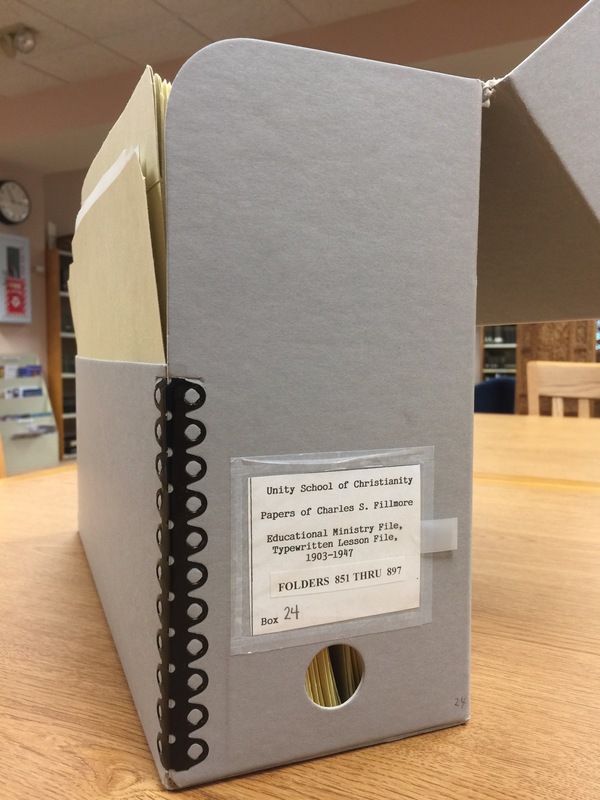 Each folder contains the typewritten text of a sermon or lesson given by Charles Fillmore. There are about 825 such folders in boxes 24 through 51. This is the same material that Rev. Bob Brach draws from for his Unity Classic Radio program. Scanning Box 24 took me a day. It took me another day to convert the scan into a searchable PDF and to create a machine-generated transcript of the content. There is a now a list on TruthUnity, Unity Archives Folders, that has links to each of these folders. Click on any of those links and a page opens for you to download the PDF. What these pages do not have is a clean transcript of the content. It does have a machine-generated transcript, but there are so many mistakes that these transcripts are nearly useless. That means that Google will barf when it tries to compile the content for doing Internet searches. Here’s my proposal: I will spend less time cherry picking and spend more time compiling entire boxes from the Unity Archives if you will offer some time to create clean transcripts of the content for Google to use in compiling for Internet search. When you send me a clean text file, I will post it, Google will compile it and the world will find it — not by tags, but rather by Internet search. To contribute to this project, download the PDF and the machine-generated transcript of the folder. Then send back to me the same transcript, but with text that has been cleaned and is free from the errors. In other words we need to convert the machine-generated transcript into a clean transcript. We need only the text. You can pasted it into and email and send it to me. I’ll post it and, unless you’re bashful, you’ll get credited as the transcriber. Know that all of the digital files on TruthUnity flow back to Unity Archives. The vision is that one day we will see these 92 boxes — with clean transcripts — on the Unity site, managed and interpreted by the professional staff of Unity Archives and freely available to Google and other Internet search engines for compilation. Then the Unity teachings and message will have a whole new pathway into the noosphere of human consciousness. Then you and I and the scholars and the professional staff at Unity Archives can do what we do best — to interpret and apply the Unity teachings. Then all of us will be freely and fully capable to pan for the gold that Charles and Myrtle left for the world. Then all of us can be cherry-pickers.